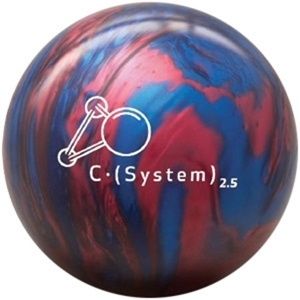 The all new Brunswick C System 2.5 Bowling Ball! This new line of performance bowling balls features Chemical Friction Technology (CFT). As Salvino explains, “The coverstock was chemically designed to have shaped molecular structures that produce a high coefficient of friction. Because of the shape of the molecule, when the ball goes into rolling friction, which occurs at the back part of the lane, slippage is eliminated and the ball will give you maximum entry and carry. This is the advantage of chemical friction versus mechanical friction. The Chemical Friction Technology in the new C•(System) 2.5 is a difference you can feel!